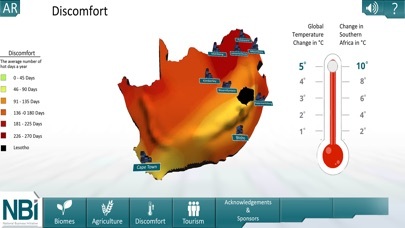 The NBI Climate mApp tells the story of possible climate change scenarios in South Africa and their consequences for biodiversity, agriculture and human wellbeing. 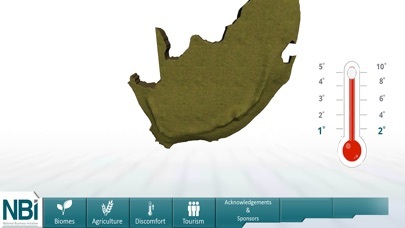 It is an interactive platform, developed by the National Business Initiative, that is designed to illustrate how important it is for South Africa that local and global leaders collaborate to increase climate ambition, reduce emissions, and stabilise the average global temperature increase at 1.5°C above pre-industrial levels. Any outcomes that fall short of this will have a devastating impact on our country’s biodiversity, our water availability and our agricultural capacity because the rate at which average temperatures increase in the Southern African region is roughly twice that of the global average. This means that a 1.5°C increase at the global scale translates to a 3°C temperature increase locally. Current research shows that, in 2015, global average temperatures have already reached 1°C compared to the average global temperature in pre-industrial times, making the regional average increase in temperature 2°C. This application presents a conservative prediction of what South Africa could look like if we continue along the path of Business as Usual. This scenario leads us towards a 4°C global average temperature increase that translates to 8°C locally, however, this DOES NOT HAVE TO BE OUR LIVED REALITY. If policy and decision makers, business, and civil society recognise and unite against this common threat to our economies, our ecosystems, and our livelihoods, AND take the necessary actions, there is a chance that we can stabilise global warming at 1.5°C. This augmented reality application is based on aggregated data and advice provided by the country’s leading climate scientists. These include experts from the CSIR, Wits University, The University of Cape Town, and Stellenbosch University. The two most recent IPCC reports as well as climate research compiled for the Department pf Environmental Affairs, and the Department of Agriculture, Fishing and Forestry were also closely referenced. Users can choose to either experience the 3D version of the application or to download the marker and explore the Augmented Reality version. There are 3 Climate Change impacts that can be explored: the impact on ‘Biomes’, ‘Agriculture’ and ‘Discomfort’. 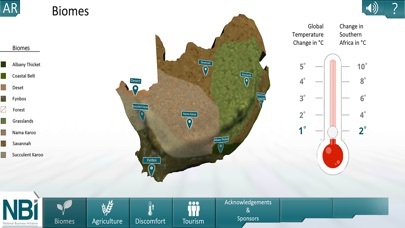 In the ‘Biomes’ section, they can explore Virtual Reality renders of what each of the South African biomes look like as well as use the temperature slider to see how the spread of the biomes change across the country as temperatures increase. In the ‘Agriculture’ section, users can witness the effects of temperature increases on the crop and livestock viability across the country. The Discomfort section illustrates how increasing average temperatures will result in an increase in the number of hot days per year and the voiceover explains how this affects human wellbeing. Finally, there is a ‘Tourism’ section that allows users to watch videos from some of South Africa’s most beautiful tourist destinations to illustrate the beauty of the country and inspire action to protect what we have while we still can.